Discussion in 'Oroville Dam' started by Mick West, Feb 8, 2017. The geologic map is good for understanding the underlying geologic formation but does not well address the surface soils upon which the overflow spillway is constructed. Below is a surface soils map with suitability for shallow excavations characterized. As can be seen, the suitability rating is 1.0 for most of the surface soils present at the spillway. A 1.0 rating indicates the surface soils are unsuitable for shallow excavations due to the presence of soft and hard bedrock. Hence, the overflow spillway was likely constructed on soft and hard bedrock. I suspect that's just there as a combination of an access road, and to cover the higher rocks at that end. The weir is only partial at that point, but it seems like it's going more directly into rock. The hole formed to the SW (right in these pics), seemingly just in front of the area where they just added a lot of new cement over some flat ground that looks like it's filling a dip. That rating is for shallow excavations, and apparently shallow bedrock causes a low rating because there isn't enough dirt to be useful. What is needed are ratings of the bedrock. The rock is described as "hard amphibolite". This picture from the first page of this thread shows the normal overflow was cut through rock. The growth nearby implies that we're not seeing bare rock on some of that surface, but the bedrock seems to be near the surface. So the main area of interest (according to KCRA) is apparently not where was originally speculated (although I'd imagine they fill that hole too). It's nearer to the main spillway, which creates additional worry. "The foundation rocks at the site are entirely metamorphics and while appearing to be largely mega igneous may contain meta volcanics and meta-sediments. The terms amphibolite, amphibolite schist and greenstones are applicable generally to this type of rock. ... The rock exposed in the channel area should prove suitable for overpoured spillway if moderately protected." "The accelerographs are located on the dam, which is located on rocks of the upper Paleozoic 'Bedrock Series'; dense and usually massive metavolcanic schists. The maximum thickness for these rocks in this area is 1500m." One of the references describes the Bedrock Series on page 77, but without details of the dam site. Multiple deep looking erosion sites. Your original assertion, Mick, that the road to the rec area would be blown out have proven true. Is there a reason that drainage was not designed into that area, culverts, French, whathaveyou? The road was always considered incidental in cases of e-spillway use? The reason was that it would be impossible to provide sufficient drainage unless they basically built the road like a bridge. 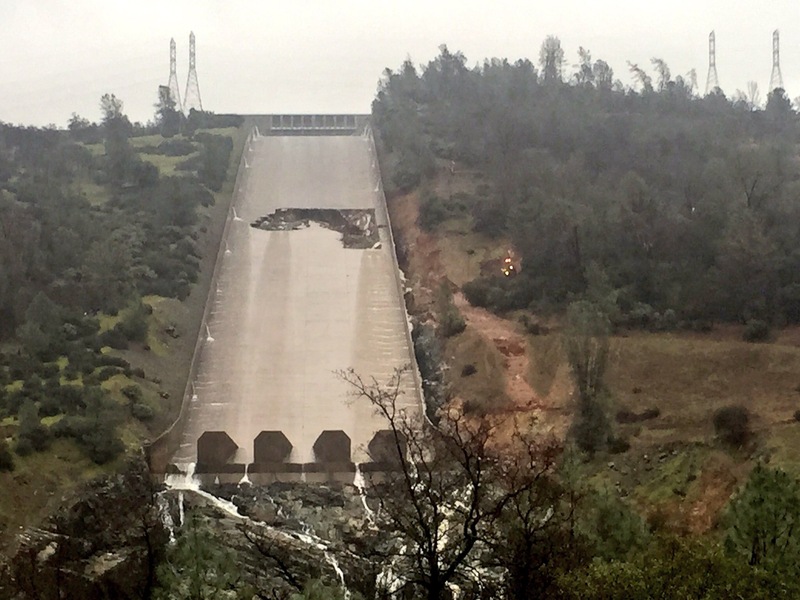 The road loss was inevitable with anything more that the most trivial overtopping of the spillway. Hi Mick, at what lake level is the main spillway not able to release any water? Basically, a minimum height the Lake could get to in the next few days. Jason, do a Google search for Lake Oroville and then zoom in on the dam and switch to the "Earth" photo view. The aerial picture happens to have been taken when the normal overflow was in use, and you can see that the water level totally exposes the emergency overflow concrete structure. They obviously can get the level low enough to deal with issues around the emergency overflow... depending upon the rain and snow melt coming in right now. They've given up trying to protect the normal overflow spillway and are only concerned whether that spillway's damage erodes further upstream. These pictures show that the soils below the auxiliary spillway were being washed away by the flow, and that's as expected. There was also erosion progressing toward the main spillway, which again seems expected. The photos show that the eroson was very close to both the main spillway and the weir, but has there been any mention of the "boil" or its location this morning? That was what triggered the evacuations last night, and it would make sense that the boil would be the focus this morning. It is good to see that there is no continuing flow of water under the weir now that the lake level has dropped. Yeah, the one closer to the dam looks like more of a concern to me. You can see it's cutting into an aggregate of large rocks and dirt and has gone down to bedrock in parts. It looks like it went back as far as the new concreted rocks . (actually it's back at the stepped concrete blocks/road that's original) The fence there gives a good reference point. The billion dollar question is what's under the weir, and how the weir ties into the bedrock. If all the loose material were swept away, what would remain? And how can they plug this with bags of rocks? Will they add cement? They better get started! I agree, the sixty-four dollar question is how well the weir is supported. People forget that the dam was commissioned more than 40 years ago, and the people that designed and built it may no longer be around to consult. Original documentation developed at the time may have been lost or degraded to the point it illegible. One way to find out is to put a track hoe down there and start digging. But I can't imagine that either the designers or builders wouldn't have anticipated the erosion of the soils and put structures in place that would withstand such. It is also reasonable to think that they also determined the depth of soils left on the auxiliary slope, perhaps by drilling, so that they'd have some idea of how much mud they'd be dealing with in the discharge pool at the bottom of the hill. Speaking of which, there's also been no mention of water levels in that discharge pool, or how they might be effecting operations at the up stream power house. Are these holes? or just rocks in front of it? They said yesterday the power station was shut down because the pool level was too high. That is probably a normal occurrence when they put a lot of water down the main spillway. What is the worst case scenario? If the emergency spillway wall fails? Almost certainly rocks, likely the shadows of rocks.. 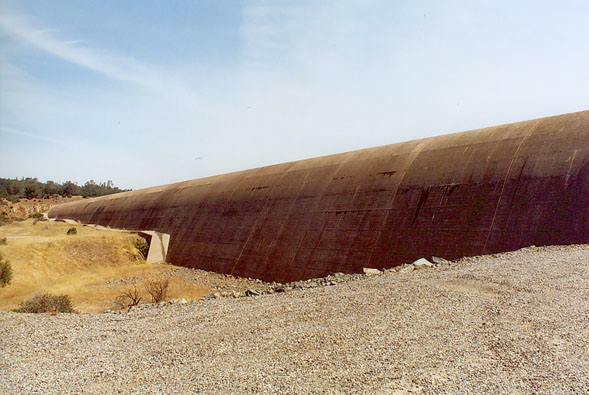 The regular spillway was a straight shot down smooth concrete, the large block there is not intentional. There are large concrete pylons at the end of the spillway, to reduce the erosion when it flies off into the river at the end. A 30-foot-high wall of water leaps down the mountain. If the emergency spillway weir breaks, then that's an uncontrolled flow of water, possibly 30 feet. The VERY worst case is a breach of the dam itself, which could not be stopped, would erode rapidly, and would probably drain hundreds of feet, flooding nearby towns, millions of acres of land, and possibly Sacramento. That seems very unlikely. New member here. Have been following for about 24 hours as I'm a science geek and have evacuated family members. My current question of interest is about what kind of cfs the downstream levees are currently seeing? Having lived through the 86 and 97 floods there, the primary issues were levee failures. This is obviously a much more complex situation, but the levees should still be a primary concern as we are currently seeing 100,000 cfs out of the damaged main spillway. I found a map in this report (which you may have all already seen) with the various levee tolerances. (Fig 4 of report). Does anyone know what kind of cfs the levees are currently seeing? Looks like some of these levees are only engineered to tolerate 150,000 cfs. Yes, but he mentioned blocks "half way down". Half way down is the hole. But wouldn't that level of water flow eat through almost anything? We are not talking about a little water. That level of flow would continue until the entire reservoir drained down 30 feet. I calculated the cfs of such an event, it would be a magnitude higher than the 100,000 cfs that the damaged spillway is experiencing. And just the cfs going out the side of the damaged spillway ate through the rocks in a very short time. A complete failure of the emergency spillway wall looks like it would carve a channel down to river level in a very short time. 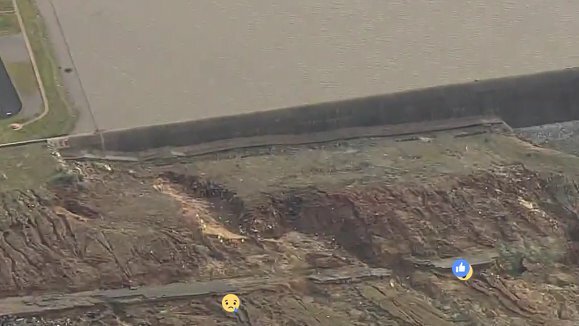 If the dam itself is breached that's a different story as it's just compacted rocks and dirt most of the way down. But that's behind the ridge to the SW of the main spillway. It will be interesting what this next press conference has to say. I'm curious which of the erosion scars are most concerning and which was the one that was growing fast to cause the alarm last evening. Proof of that is that the normal spillway's intake is cut into rock, and water has been flowing over that rock just fine for years. AFAIK Levees generally don't directly fail from cfs flow, they fail from overtopping. So the thing to watch is the river level (which obviously is related to cfs). Apparently there's something like 120,000 cfs in the Feather River now. 150,000 is a record flood but not catastrophic, while 200,000 cfs is a catastrophe. I've seen estimates of 250,000 to 500,000 if there was a total failure of the full emergency overflow. Inflows to the reservoir peaked at 190,000 cfs this week. If the reservoir had been full, all of that 190,000 cfs would have flowed down the untested emergency spillway and into the Feather River floodway, where it would be joined by another 10,000 cfs or more from local drainages. The design capacity of the floodway is 210,000 cfs and would have theoretically been able to accommodate such an event, but it would have been 25 percent larger than the record flood of 1997 that peaked at just over 150,000 cfs below Oroville Dam as reported by Maurice Roos, the former state hydrologist. That flood as reported here breached the levee, killed 3 people, destroyed 322 homes, and triggered the evacuation of 38,000 people. If the reservoir had been full when the 1997 peak reservoir inflow of 300,000 cfs occurred, the ensuing destruction would have made Hurricane Katrina look feeble. I believe that the main spillway can operate down to 813 ft.
Where do you find these awesome images? That is fantastic. Thanks. There are multiple galleries on the left, the above pic is from the Dedication 1968 gallery. Sign up to download HD images, generally free, public domain.